Poet C. Dale Young: I assumed the image of the bougainvillea would make an appearance, but I also assumed the image of the wings would as well. So, it was interesting to see that the wings didn’t make the cut. Artist Amy Meissner: I was inspired by the visual imagery but also the emotional quality—it hit a nerve for me with regards to family history and how this shapes us all. What was your hope, as a designer, to bring to this collaboration? Designer Debbie Nadolney: To integrate the context of the poem and the image by building them a visual home to co-exist in. Artist Amy Meissner: I wanted to explore “drawing” with the sewing machine. The original piece was created on an embroidered vintage linen napkin and is called “The Way We Do Things in This House.” It explores the notion that it is difficult to escape the way we have been raised. When the napkin is folded properly, only the woman and the flowers show. It isn’t until you unfold the whole thing that you see the grip she has on the child. Poet C. Dale Young: Well, the poem lives quite literally in my head as well as on the page, so it has its own life in my head that is quite consistent. That said, in my head there is a mother and a young son. 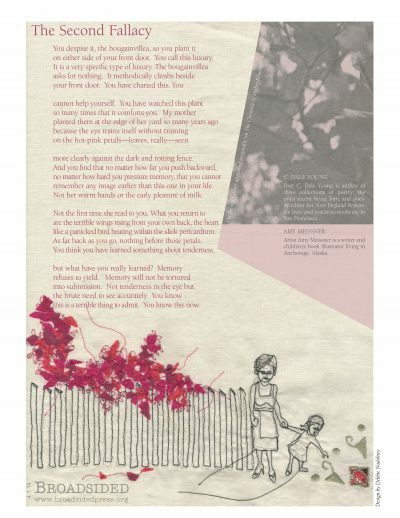 On the broadside, there is a mother and a young girl. This makes me happy because it means the poem made room for the reader, in this case the artist, who is female. Poet C. Dale Young: It is always interesting to see how one work of art can be reflected in another work of art. In the case of the broadside, the new work of art exists side by side with the poem. That is surprising. And in the history of art, it usually works the other way around, where poems have been created in response to visual art. Artist Amy Meissner: I was surprised by the graphics. The original piece relies heavily on white space and emptiness. Poet C. Dale Young: I have a number of ekphrastic poems. The most recent one is based on a painting by Jasper Johns. Many things inspire me to write. Art is just one of many things. I have been inspired to write poems because of songs on the radio, food, a whole host of things. Poet C. Dale Young: I have no idea. Maybe I should ask my partner, who is a composer. Artist Amy Meissner: “Sweet Disposition,” by The Temper Trap. I have know idea why I say this…I must have been listening to it when I was working on it. Poet C. Dale Young: I had the good fortune to visit the Hermitage in St. Petersberg an hour before it opened to the public. Standing in front of Rembrandt’s The Return of the Prodigal Son, I was so overwhelmed I felt tears run down my face. Artist Amy Meissner: I was recently in Mexico and was stunned by a 3-foot high sculpture of Noah’s Ark, which represented the history of the world from the time of the Flood to present day through miniature figures of animals, people, and the dead. My 5-year-old daughter and I went back to look at it many times. She totally understood it. Artist Amy Meissner: Dirt Work, by Christine Byl. Designer Debbie Nadolney: A collection of poems by Eileen Myles called Snow-Flake & Different Streets. Poet C. Dale Young practices medicine full-time, edits poetry for the New England Review, and teaches in the Warren Wilson MFA Program for Writers. A recipient of fellowships from the National Endowment for the Arts, the John Simon Guggenheim Memorial Foundation, and the Rockefeller Foundation, he lives in San Francisco. This poem will appear in his forthcoming collection The Halo (Four Way Books 2016). Image: “The Way We Do Things in This House,” thread on linen. Designer Debbie Nadolney is an artist and production designer based in New York City and Provincetown, MA. She is currently the owner, gallery director and curator of AMP: Art Market Provincetown. C. Dale Young has Vectorized a notice board in the hospital where he works. Artist Amy Meissner Vectorizes a tree in snowy Anchorage—proving that Alaska is a magical land where bouganvilla blooms on snowy birch!